Derwin Armstrong allegedly stole an ambulance from a hospital in Nacogdoches and made it as far as Seven Oaks before getting his tires spiked. El Bizarro, Stolen Ambulance from Nacogdoches Stopped, SEVEN OAKS, November 9, 2014 - At around 4 am on November 9, 2014, a stolen ambulance out of Nacogdoches was reported to have crossed into Polk County while being pursued by Diboll Police. 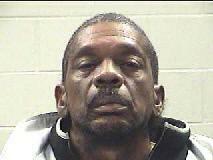 Derwin Armstrong, 55, of Center, allegedly stole an ambulance from a hospital in Nacogdoches and headed south. He made it all the way to Polk County with Diboll PD in hot pursuit. Armstrong managed to get through Corrigan and was approaching Seven Oaks and now being pursued by Sergeant Glenn Edwards with the Polk County Sheriff's Office. Edwards used his radio to summon help from Deputy Jacob Hopper. Hopper used Stop Sticks to spike Armstrong's tires. The spiked tire (front driver's side) blew out in the vicinity of the rest area in Seven Oaks on the south-bound side of 59. Pursuit ended. Sergeant Edwards was able to apprehend and cuff Derwin Armstrong without incident. Armstrong allegedly has mental problems. As far as we know, Armstrong was trying to drive to Houston in the stolen ambulance. Armstrong is facing charges of unauthorized use of a motor vehicle and evasion. The stolen ambulance was recovered by Riley Wrecker Service out of Corrigan. In 2009 an ambulance rolled in Seven Oaks. In 2008 an ambulance caught fire while transporting a patient. In 2013, a car slammed into an ambulance causing 2 to be hospitalized. Once the pursuit ended, Seargant Glenn Edwards with the Polk County Sheriff's Office was able to apprehend and cuff Armstrong without incident. Deputy Jacob Hopper spiked the front driver's side tire to end the chase.